One of the more notable independent record companies of rock’s first decade was founded in New York City in 1944 by Hy Siegal, Ted Gottleib along with husband and wife Ike and Bess Berman, all of whom worked at the Rainbow Record Shop in Harlem on 125th Street near The Apollo Theater from which they took the name. A year after it launched the Bermans bought out their partners and quickly carved out a reputation as one of the finest gospel label’s around, their centerpiece being the great Mahalia Jackson whose “Move On Up A Little Higher” was a million seller, one of the most popular gospel records ever. The company’s roster of gospel acts included such huge names in that field as The Dixie Hummingbirds, Roberta Martin Singers, Alex Bradford and their jazz line was equally impressive with Illinois Jacquet, Earl “Fatha” Hines, Willie Bryant, Arnett Cobb and an early Dinah Washington among their most noteworthy artists. They also covered blues with Champion Jack Dupree and Duke Henderson and country music with Johnnie & Jack (and The Tennessee Mountain Boys), and even the Yiddish comedy duo of The Barton Brothers. Apollo also served as one of Wynonie Harris’s stops in his pre-rock days which resulted in two national hits. They took awhile to firmly commit to rock ‘n’ roll but once they did it rivaled gospel as their most active line of music throughout the 1950’s. Saxophonist Charlie Singleton was their first foray into this realm but he had only a single release. Another sax star followed in Willis Jackson but their interest in instrumentals began to wane when Bess Berman, who had become one of the first females to run a record company while Ike handled the mechanical end, sought to capitalize on the growing popularity of vocal groups. To that end she got their most notable rock acts in this field by changing the musical focus of two groups who’d initially recorded with the company as gospel acts, with The Larks emerging from The Selah Jubilee Singers while The “5” Royales had begun as The Royal Sons Quintet. The “5” Royales became the top rock group in the country in 1953 and provided the label with their biggest sellers but royalty disputes led to the group jumping ship to King Records in a contractual battle that ended up in the courts. Though Apollo won concessions in the ruling it nevertheless cost them their top artists just when they could least afford it as Bess fell ill in 1954 while the legal issues played out and in early 1956 Ike Berman died, leaving the company in disarray. During this period the label managed to get some other promising talents to expand their roster with the biggest potential stars being a teen aged Solomon Burke along with shock-rock originator Screamin’ Jay Hawkins, as well as vocal group The Chesters who’d go on to fame soon after as Little Anthony & The Imperials, but none them dented the charts during their time with the company. Despite their declining fortunes they did house some interesting figures including New Orleans rocker Eddie Bo, jack-of-all-trades Sax Kari, and a plethora of vocal groups such as The Casanovas, The Keynotes, The Opals and The Vocaltones, but other than one record by The Cellos in 1957 none of their later acts scored any hits despite some good efforts from all of them. Emblematic of their bad luck was the fact that in 1959 The Sparks Of Rhythm cut a song called “Handy Man” which didn’t draw any commercial interest. The next year however the group’s lead singer, Jimmy Jones, went solo, re-arranged the song and scored a huge hit (#2 Pop; #3 R&B) for another label. 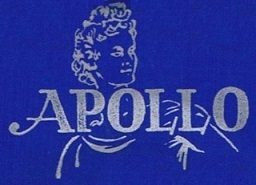 By the late 1950’s Apollo had no viable artists outside of their still healthy gospel line and the company folded in 1960.